December 18, 2013 (Nelson, British Columbia and Sausalito, CA) – Fred Water and Baldface Lodge are partnering this winter to create limited edition Baldface Lodge x Fred Water bottles to hydrate the snowboarders that ride Baldface. The flask-shaped Fred Water bottles are lightweight and fit perfectly in outerwear jackets and pants pockets, making them a great option for staying hydrated while riding the more than 500 inches of snow Baldface’s 32,000 acres of rideable bowls and peaks receive each winter. As snowboarders head up to beautiful peaks this season, Fred and Baldface want to give them a heads up that drinking more water in the mountains helps you stay more alert and avoid altitude sickness. The higher the altitude the lower the air pressure is, and water evaporates from the body faster in low air pressure making dehydration a threat at wrecking bluebird powder days! 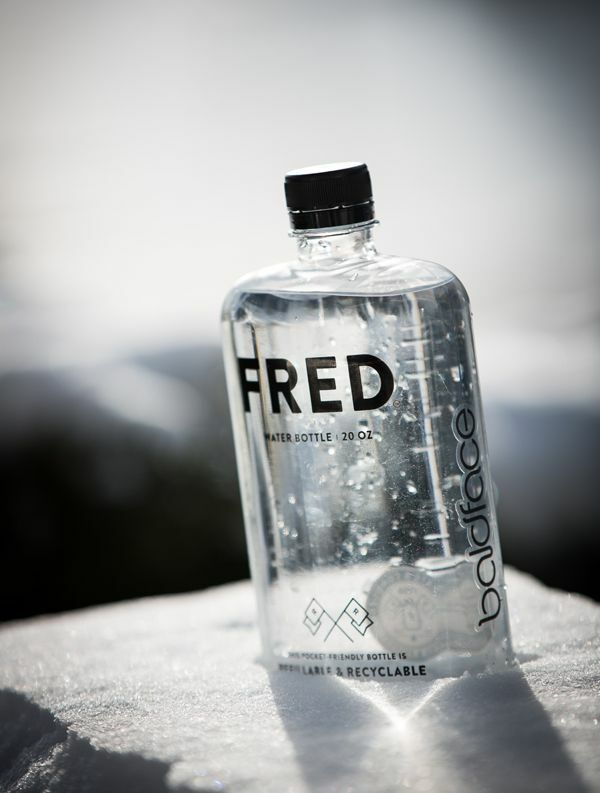 The limited edition Fred Water x Baldface bottles seen above are now available exclusively at Baldface Lodge. The rest of the flask-shaped Fred Water bottles are available to everyone at select retailers and on Fredwater.com. The friendship between Fred and Baldface began naturally last winter on a powder day when Fred Water’s Co-founder Adam Gayner met Baldface’s Founder Jeff Pensiero at the lodge. The relationship grew out of their shared passion for the mountains, and the importance of staying hydrated. Fred’s refillable BPA-free flask-shaped bottles make drinking water an easy thing to do in the lodge or out riding powder. Baldface will also have a complimentary Fred Water refilling station in the lodge to keep everyone hydrated. “The highest peak at Baldface is 7,678 feet, and drinking lots of water is essential in high altitudes. I really like rebellious feel of the Fred bottles, and am glad to be working with the brand,” said Jeff Pensiero. “I always have trouble with my water freezing on longer tours. Fred’s great, I can keep it inside my jacket and push for the top without worrying if I can drink on the summit,” said Clayton Marr, Baldface guide. Two guys in Brooklyn created a brand that advocates the indisputable greatness of water, and they offered it in a flask-shaped bottle that makes staying hydrated throughout the day easy. Fred’s co-founders love water, and feel that water gets a bad rap. Fred Water is pretense-free, velvety smooth natural spring water from the Catskill Mountains of New York in the good ol’ USA. Fred comes in refillable, BPA-free bottles designed to fit pockets, so keeping water around is easy. Sure, the company doesn’t make money when people refill Fred bottles with tap or filtered water. They are okay with that, as long as people drink more water, consume less sugar and use less plastic. When it’s time for a new Fred bottle, just recycle the old one. The company makes t-shirts out of 100% recycled plastic bottles so plastic moves upstream into durable goods and not downstream into landfills or oceans. Refill and respect: Learn more at FredWater.com. Baldface Lodge is Nelson’s snowcat skiing and boarding powder destination. With over 32,000 acres of skiable terrain, open bowls, peaks, perfectly spaced trees and 500+ inches of snow – you never have to worry about competing for fresh tracks. From the moment you arrive at Baldface you’re a part of our family, and we aim to show you incredible service and an unforgettable powder experience that will keep you coming back for years to come. For more information, visit www.baldface.net.